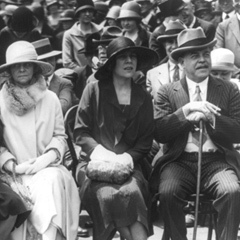 Image courtesy of Library of Congress Speaker of the House Nicholas Longworth of Ohio (far right) and his wife Alice Roosevelt Longworth joined 5,000 onlookers at the Capitol to observe the Hopi Tribe. On this date, Hopi Indians from northern Arizona performed a series of sacred dances for the public and prominent U.S. government officials on the East Front of the Capitol. Critics had been seeking federal intervention to ban this particular ceremony—a series of four dances performed annually—for being too dangerous because it involved stepping among and handling poisonous snakes. The Hopi sought to use the public performance to demonstrate that the dances were a safe and important cultural practice. The dance “portrays a solemn religious ritual of the tribe itself,” Senator Ralph Cameron of Arizona reminded his colleagues, describing his constituents as those “who seek by this demonstration before the Congress . . . to show its sincerity and religious character and thus allay what they deem the unfair effort on the part of some people to deprive them the right to conduct this religious ceremony.” In attendance among the crowd of nearly 5,000 onlookers were Vice President Charles Dawes, three Supreme Court Justices, Speaker Nicholas Longworth of Ohio and many other Members of Congress. The Native Americans, adorned in their traditional feathered costumes, awed the crowd, especially when one performer kissed a poisonous snake without being bitten. More than a year later, the Bureau of Indian Affairs tried to ban the dance, but quickly relented after being criticized for potentially interfering with religious practice. The Bureau also deferred to the important cultural nature of the ceremony.